Addressing the multiple challenges facing global agriculture requires integrated innovation in areas such as seeds, biotechnology, crop protection, grain storage and transport. Innovations related to plant improvement and the development of new or improved plant varieties will only happen at an optimal level if plant breeders' rights (PBR) are properly protected. The objective was to analyse the evolving landscape of wheat plant breeders' rights to address the dearth of empirical evidence of the patterns and trends of wheat varietal improvements in South Africa. We compiled a detailed and novel count and attribute database of wheat varietal innovations in South Africa from 1979 to 2013 using various sources. This data set was then analysed to ascertain the main trends in, and ownership of PBRs for wheat varietal improvements in South Africa over this period. 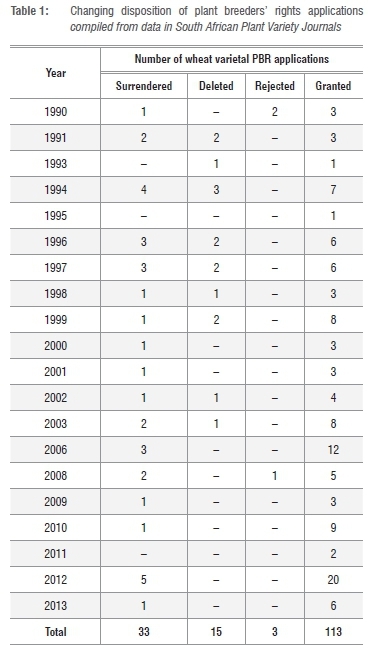 A total of 134 PBR wheat varietal innovations were lodged from 1979 to 2013, an average of 6 applications per year. The administrative delays in granting PBR applications were substantially reduced by 77 days during the post-deregulation period (after 1996), indicating increased efficiency. The main PBR applicants were Sensako (39%), the Agricultural Research Council Small Grains Institute (ARC-SGI) (25%) and Pannar (15%). The ARC-SGI contributed to some of the PBRs owned by private companies through shared genetic resources before Plant Variety Protection (PVP) was implemented. Future innovations and dissemination of wheat innovations can be stimulated by plant variety protection, together with broader variety sector legislation that encourages both public and private sector investment. Pardey et al.7,8 argue that plant varietal rights are subject to controversy and ongoing public policy scrutiny and debate. In order to inform these policy debates, there is a need to understand the evolution of varietal rights and the extent of the varietal rights which are granted. In addition, it is also important to understand the changes which are experienced over time regarding the rights on offer; changing ownership of the rights (including comparison between public and private, as well as domestic and foreign breeders); impacts of plant variety protection on varietal development etc. Which trends can be observed in the wheat varietal improvements subsector in South Africa? How have plant breeders' rights for wheat varietal improvements evolved? Who are the main plant breeders' rights holders in the wheat sector? What are the effects of these developments for diversity and competition in the South African wheat breeding industry? Which measures can be taken by the South African Government to restrict or reverse possible negative impacts of these trends in light of relevant policy objectives? The protection of intellectual property rights of plant breeders was recognised from the 19th century onwards. The International Union for the Protection of New Varieties of Plants (UPOV), established in 1961, seeks to harmonise plant variety protection (PVP) laws and standards of protection across member countries.10 Plant variety protection was almost exclusively the protection granted for plant-related innovations, until 25 years ago.1 Plant variety protection, also called 'plant breeders' rights', is defined as an independent sui generis form of protection of new plant varieties for essential features (usually phenotypical).2 Plant breeders' rights (PBRs) constitute a form of intellectual property right that grants the breeder of a new plant variety the exclusive rights to benefit from his or her variety. In addition, innovations in plant breeding are driven by the need to acquire and/or increase market share.3 Plant breeders' rights provide legal protection for the plant breeder to exclude others from commercialising the protected variety for a specified number of years, usually five years. This gives protection against unauthorised copying (propagation) of the protected variety for commercial uses by farmers and competitors. At the end of the protection period, the breeder can issue licences to other breeders who might be interested in using any material of the variety in their breeding activities. The standard argument for implementing PVP is that they would stimulate and drive investments in plant breeding research and development of the domestic seed sector.11 Although PVP provide some incentives for increased plant breeding, evidence from some empirical studies show mixed results with some authors finding that it may not be strong enough to encourage plant breeding investments.11-14 For example, Tripp et al.11 studied the potential of PVP to provide incentives for plant breeding in developing countries (China, India, Colombia, Kenya and Uganda). Their findings showed that development of PVP systems in developing countries should be framed as part of a broader strategy for seed system development, as PVP may not be adequate to initiate commercial seed development. In a separate study, Alston and Venner13 found that the introduction of the PVP Act of 1970 in the USA increased public investments only (with no change in private investments) and did not affect experimental and commercial wheat yields. Srinivasan5 explored the levels in the ownership of IPRs over plant varieties, based on data from 30 UPOV member-countries. He argues that the combination of ownership of plant variety rights and growing plant variety protection systems in the developing world would have significant influence on future plant innovations and distribution of market power between companies. This has implications for the structure of the domestic seed industries and gaining access to protected varieties and associated plant breeding technologies. Diez15 analysed the impact of plant variety rights on public and private research sectors in Spain, focusing on the role of PVP in altering research incentives in the understanding of intersectoral differences. The study showed that there were positive incentives, particularly for the private sector, for increased investments in plant breeding driven by higher appropriability conditions. Wright and Pardey16 argue that with the exception of a few, many public agricultural research institutions in developing countries have made little progress in developing and commercialising their innovations. Related to this, Alston and Venner13 state that despite plant variety protection providing some exclusive rights to the plant breeder, sometimes the high enforcement costs and the difficulties in monitoring areas planted to a crop, such as wheat, and in determining the source of seed, make it difficult to exclude farmers and seed companies from freely using protected varieties. The PBR provides the owner of the variety the opportunity to obtain financial reward from the investments put into breeding and development of the new variety in order to recover the costs incurred. Plant breeders' rights have evolved since the nineteen thirties, when crop improvements became an applied form of genetics practised by specialised institutions and seed companies.18 The owner of a PBR has the privilege of a sole right period of 5 years and during this period the owner does not award licences, thus securing a chance to obtain return on investment for plant varietal improvements. This means that the breeder is the only one who can use the materials of the variety while it is protected. After the 5-year period, the owner of a PBR can allow the granting of licences through an attorney and the relevant contract should show how royalties are to be paid. These licences allow the owner to receive payment on any breeding material that is used by other breeders from the variety. In the case where the holder of the right refuses to issue licences to other persons who wish to use and market the material from the protected variety in the breeding programmes, the Registrar from the Department of Agriculture, Forestry and Fisheries (DAFF) may issue a compulsory licence (De Bruyn E 2013, oral communication, Jan 22.). After the expiry of the full period of the plant breeders' rights, the variety becomes public property and anyone may propagate and sell it. The holder of a set of plant breeder's rights is required to maintain the reproductive material during the period of the rights. It is, however, not clear what happens to the said material after the period of the rights has expired. There is a test for the distinctness of the candidate variety: it should be compared with other varieties of the same kind of plant, of which their existence on that date is a matter of common knowledge. The holder is not entitled to exclusively make available plant material after the holder's rights have expired. This is a problem for other interested parties, as such material will then not be available for comparison purposes with other material that enters the market. DAFF does not have facilities to maintain all the plant material of varieties which have been granted plant breeders' rights, so they are sent to the gene bank at the Agricultural Research Council Small Grains Institute (ARC-SGI). Plant breeders' rights (PBR) in South Africa were analysed to assess the sources of intellectual property rights in wheat varietal improvements in South Africa. The paper used secondary information collected from various sources on wheat varietal improvement policies, and changes in wheat plant breeders' rights. Other studies that have analysed changes in plant variety protection, focusing on trends and changes in plant variety protection policies, include Diez15, Srinivasan5, Louwaars et al3 and Pardey et al.7,8 In these studies, trends were analysed to understand the evolution of plant varietal protection. This paper applies the same approach in order to understand the changes that have shaped the South African wheat varietal improvement landscape to date, and to allow a comparison with other countries at a later stage. A detailed and novel count, and attribute database of wheat varietal innovations in South Africa from 1979 to 2013 was compiled. Consultations were made with key informants from the Department of Agriculture Forestry and Fisheries, ARC and the South African National Library during development of the database. The database provides information to assess changing amounts and forms of wheat plant breeders' rights, and changes in the types and pool of the applicants receiving the rights. The database gathered data on applications, granting, and rejections and surrendering of the PBRs. Additional information captured in the database includes plant variety name, alias name, applicant name, applicant type, application date of PBR, grant date of PBR, withdrawal date of PBR, and date end of sole right of PBR, showing end of sole right month and date of termination of PBR. Data were manually compiled on wheat variety rights from information on wheat plant breeders' rights applications and granting obtained from the Plant Variety Journal of the South African Department of Agriculture Forestry and Fisheries. Additional data were gathered from the South African National Library and the ARC. These different sources of data were used to backfill the data series to come up with a complete database. The data series included 134 applicants for wheat variety rights lodged between January 1979 and December 2013. The empirical analyses were based on descriptive statistics, trend analysis and graphical representation of trends and ownership of wheat varietal improvement PBRs. Figure 1 shows the trends in annual applications for PBRs for wheat varietal improvements lodged in South Africa. A total of 134 PBRs were lodged for wheat varietal innovations from 1979 to 2013, an average of 6 applications per year. Data on the number of PBRs lodged for wheat varietal improvements since 1979 show a fluctuation trend with some years having high numbers of applications, and others recording very low applications. For example, 2012 received the highest number of PBRs for wheat varietal improvements, with 14 applications, while 2004 recorded only 1 application. A possible explanation for the uneven trend in applications could be that some breeders chose to apply for their new varieties to be included on the national variety list but did not apply for varietal protection. The variety would then be included on the national variety list so it could be known by millers and bakers, but unless the owner applied for PBRs, anyone could use any material on the variety without paying the owner for IPRs. Outbreaks of pests or diseases can trigger more investments in wheat varietal improvements in some years, compared with others. For example, the Ug99 wheat stem rust race group from East Africa was detected in 1999 and since then, 11 pathotypes within the race group have been identified across Africa and a few neighbouring countries. In South Africa, 'four races in the Ug99 lineage have been detected - TTKSF (in 2000), TTKSP (in 2007), PTKST (in 2010) and TTKSF+ (in 2010)'19. In Addition, a new Ug99 variant (race TTKSF+) was identified in South Africa and Zimbabwe in 201219. The identification of new variants of Ug99 in recent years, particularly from 2010, could have triggered increased investments in wheat varietal improvements, leading to high numbers of PBR applications in 2012. Generally, the main triggers for wheat varietal improvements in South Africa include the outbreak of pests and diseases, such as wheat rust, septoria and Russian wheat aphid, and different environmental and climatic conditions. It is also important to understand the effects of the abolishment of the South African Wheat Board in 1996 and the establishment of the ARC-SGI in 1991 on the number of applications for PBRs for wheat varietal improvements. 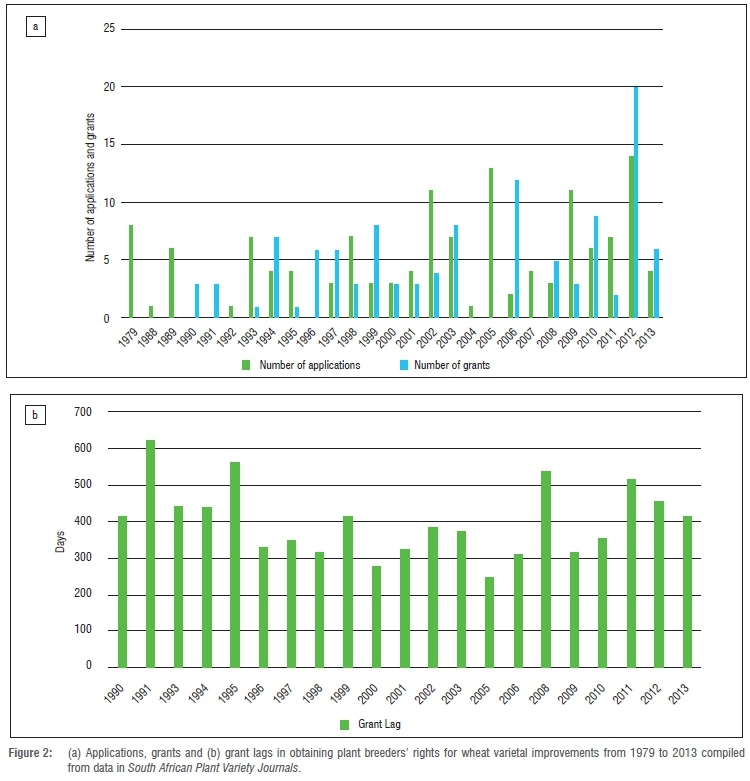 Analysis of the time periods before and after the abolishment of the Wheat Board shows that 77% of the applications were lodged between 1998 and 2013 (after the abolishment of the Wheat Board). The number of PBR applications increased faster after the abolishment of the Wheat Board, at an average of 6 applications per year, compared with 4 applications per year for the time period 1979-1997. In recent years, the numbers of wheat variety PBRs have substantially increased, compared with the past. From the results, the liberalisation of the wheat sector can be argued to have opened competition in wheat varietal improvements and stimulated increases in applications for PBRs on wheat varietal innovations. 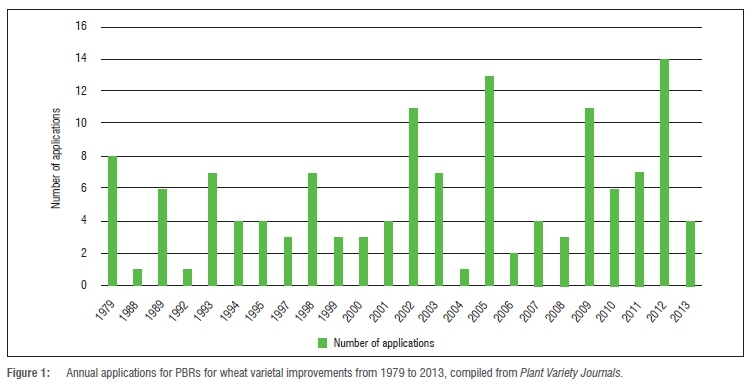 Further analysis by time period before and after the establishment of the ARC-SGI shows that only 15 applications for PBRs for wheat varietal innovations were lodged before 1991. The rest of the applications for wheat varietal innovation PBRs (89%) were lodged after the ARC-SGI was established, from 1992 to 2013. The rate of applications was six per year after the establishment of the ARC-SGI, compared with five applications per year before the ARC-SGI was established. The decreasing funding for agricultural research might be contributing to the ARC-SGI seeking revenue from their research outputs. Figure 2 presents an analysis of the wheat varietal improvement PBRs applications, grants and lags. Panel (a) plots PBRs applications and grants in each year, while panel (b) tracks the lag in days between the application and grant dates of each PBR that was eventually granted a certificate. The average time of waiting between application and granting of protection was around 336 days for the overall period of study. Analysis of the grant lags by pre- and post-deregulation time periods indicates that before 1997 (pre-deregulation period) the grant lag was 451 days and this reduced to 374 days in the post-deregulation period. When the application process starts, the sample seeds and application papers are taken and inspected before being sent for trials at ARC. If the variety is found to be distinct, uniform and stable for two seasons, the variety is then granted the PBRs. This means that the processes would take at least 300 days for PBRs to be granted. If the trials are unstable, more trials may be required and the process would take longer until all the irregularities are checked and rectified (De Bruyn E 2015, Oral communication, Aug 24). Pardey et al7 argued that administrative delays substantially lengthened the lags in the processing of applications. The grant lags (of about 300 days) were shorter after the abolishment of the Wheat Board in 1997, as well as after the establishment of the ARC-SGI. This can be considered to be efficient in comparison with the USA, where the average grant lag ranged from 500 days to 1449 days. The plant variety rights applications can at any time be: granted; abandoned or withdrawn by the applicant; deemed ineligible - such as in cases of incomplete applications; denied by the office; or still pending examination.7 In the South African context, applications for PBRs may be (a) granted if they meet the required standard by DAFF, (b) surrendered if there is need to do so if the applicant no longer needs protection and also after the completion of the right to be protected - 20 years in the case of wheat, (c) rejected if the application is incomplete and does not meet the required standards, and (d) terminated if the Registrar deems it necessary as in the event of certain irregularities (De Bruyn E 2013, oral communication, Jan 22). Table 1 shows the changing status of wheat varietal improvement PBRs, over time. For the period under review, 113 wheat variety rights applications were lodged between 1990 and 2013 and were granted, while 33 of the applications were surrendered, and 15 were deleted. The results show that only 3 cases were rejected from 1990 to 2013. Analysis of the granted PBRs for wheat varietal innovations by decade shows an average grant rate of 4 PBRs/year; 5 PBRs/year and 9 PBRs/year for the periods 1990-1999, 2000-2009 and 2010-2013, respectively. Further analysis by pre- and post-deregulation of the wheat sector shows that the grant rate increased from 4 grants/year before abolishment of the Wheat Board to an average of 7 grants/year from 1998 to 2013. In addition, from 2003 to 2013, the number of granted PBRs for wheat varietal improvements was relatively high, compared with other years, and the highest number was recorded in 2012 (20 PBRs were granted). The results indicate that plant breeders are increasingly seeking protection for their innovations. In many developing countries, national agricultural research systems, such as the ARC-SGI and Consultative Group on International Agricultural Research Institutions (CGIARs), dominate agricultural research, including varietal improvements. The development of new varieties is driven by the exchange of plant varieties and genetic resources between the national agricultural research systems and CGIAR institutions, unencumbered by IPRs.5 In this case, ownership of IPRs was irrelevant to plant breeding and for accessing plant genetic resources from other countries.16,5 Similarly, the ARC-SGI did not previously apply for PBRs, despite being actively involved with wheat varietal improvements. However, since the abolishment of the Wheat Board in 1997, the ARC-SGI increased their share of PBRs lodged by 5% to 26%, with most of the applications being made in recent years. It might be that the reduced funding for the ARC-SGI contributed to the institution seeking protection for its varieties as a way to generate additional revenue. Figure 4 presents the changing composition of applicants for wheat PBRs. The majority of the applications for wheat varietal improvements were filed by private companies (Figure 4a), the two main actors being Sensako and Pannar (Figure 4b). Pardey et al.8 found that the private sector constituted the largest share in the USA, accounting for 82% of total plant varietal rights, while the share of varietal rights owned by public entities (e.g. US and foreign universities, research foundations and government agencies) was very small, considering the high volume of research they perform. In the South African wheat sector, the public sector, especially the ARC SGI, continues to play a major role in the development of wheat varieties and has PBRs from wheat varietal improvements. Before the establishment of the ARC in 1991, the public sector made no applications for PBRs for wheat variety improvements, but since its establishment, the public sector applications for wheat variety PBRs drastically increased, with 4 applications in 1993, 4 in 2002, 2 in 2005 and 11 in 2012. The public sector made the largest number of wheat variety PBR applications (11) in 2012, compared with 3 from private companies in the same year. It is important to note that public and private sector institutions freely exchanged plant genetic resources and breeding lines before the advent of IPRs.5 Public sector institutions used to develop basic breeding lines and made them available for the development of 'finished products' by the private sector. The advent of PVP/IPRs considerably restricted the exchange of plant genetic resources and breeding lines between the public and private research institutions.20 With this background, it can be argued that the ARC-SGI has largely contributed to some of the PBRs owned by private companies through shared genetic resources made available before the PVP/ IPRs were implemented. The major role played by the ARC-SGI is supported by evidence from around the world indicating that plant-breeding innovations in non-hybrid crops like wheat have largely been sustained by the public sector. For example, Srinivasan5 found that in cases where the public sector has played a major role in plant breeding, the overall concentration in ownership of plant variety rights was lower, particularly for non-hybrid crops which are less attractive to private sector investment. In addition, Eaton et al.12 argue that although plant variety protection is expected to stimulate investments in plant breeding, for national agricultural research institutes (NARIs), PVP may address three objectives which are not always compatible: revenue collection, recognition of achievement and technology transfer. Their study found no evidence of potential revenue generation from plant breeding at national agricultural research institutes in Colombia and Uganda. In addition, one of the challenges for NARIs is to retain control of the plant breeding skills and resources for commercially important crops. For example, evidence from India and Kenya showed that the development of the private sector resulted in experienced NARI staff being hired into the private sector, making it difficult for the NARI to retain plant breeding staff and resources. This implies that although the ARC-SGI is expected to generate revenue to sustain their activities, the concentration of potential revenue generation activities in more commercial crops brings into question public research resource allocations. Public research institutions would still be required to engage in research and plant breeding for mandated crops, such as staples, which might not be very lucrative compared with commercial crops. Such investments would have to be funded by public agricultural expenditures and other sources, making it difficult for NARIs such as the ARC-SGI to focus on revenue generation in their plant breeding activities. Also, the ARC-SGI faces competition from private companies, including in retaining its breeding skills and resources. This paper analysed the evolving landscape of wheat plant breeders' rights to address the dearth of empirical evidence on the patterns and trends of wheat varietal improvements in South Africa. The aim was to provide evidence on the evolution of varietal rights; the extent of varietal rights granted; changes of the rights on offer over time; changing ownership of the rights (including comparison between public and private, as well as domestic and foreign breeders) and; impacts of plant variety protection on wheat varietal development. The study compiled a detailed and novel count and attribute database of wheat varietal innovations in South Africa from 1979 to 2013, using information from the South African Plant Variety Journal, DAFF, South African National Library, and the ARC. The empirical analyses were based on descriptive statistics, trend analysis and graphical representation of trends and ownership of PBRs for wheat varietal improvements. A total of 134 PBRs for wheat varietal innovations were lodged from 1979 to 2013, giving an average of 6 applications per year. This might have been driven by some breeders choosing not to apply for varietal protection, as well as by natural triggers such as outbreaks of pests and diseases, and different environmental and climatic conditions. The results indicate that plant breeders are increasingly seeking protection for their innovations. The number of PBR applications and grants for wheat variety innovations increased after the abolishment of the Wheat Board (6 applications per year compared with 4 per year before deregulation). The results also indicate that the administrative delays in granting PBR applications have been substantially reduced (by 77 days) post-deregulation, signifying increased efficiency in the processing of PBRs. Since the publication of the South African Plant Variety Journal in 1979, the main applicants for wheat PVP have been Sensako (39%), ARC-SGI (25%) and Pannar (15%). After deregulation, Sensako's share decreased to 34%, while those of the ARC-SGI and Pannar increased by 5% and 9%, respectively. The results show that the ARC-SGI faces stiff competition from these well-established private companies. Establishing opportunities for collaboration with the private sector would encourage wheat variety innovation development. The advent of PVP/ IPRs considerably restricted the exchange of plant genetic resources and breeding lines between the public and private research institutions. The ARC-SGI contributed to some of the PBRs owned by private companies through shared genetic resources made available before the PVP/IPRs were implemented. Future innovations and dissemination of wheat innovations could be stimulated by plant variety protection, together with the broader variety sector legislation that encourages both public and private sector investment. This work was supported by the Bill and Melinda Gates Foundation grant to the University of Pretoria's Department of Agricultural Economics, Extension and Rural Development. The paper is part of the PhD research by Charity R. Nhemachena on: 'Biological innovations in South African agriculture: A study of wheat varietal change, 1950-2013' which was funded from the Bill and Melinda Gates Foundation grant. C.R.N. conceptualised the article content and complied the first draft. F.G.L. and J.K. revised and made conceptual contributions, additions, and refined the article.